Dr. Taylor attended the University of North Carolina at Chapel Hill and graduated with distinction with a Bachelor of Science degree in Biology with a minor in Chemistry. He received his medical degree from the Brody School of Medicine at East Carolina University in 2004. Dr. Taylor completed his Internal Medicine Internship and Residency at the University of Virginia Health System. Dr. Taylor completed his fellowship in Hematology and Oncology at University of North Carolina Hospitals in 2010. He joined CCHC New Bern Cancer Care in 2010. Dr. Taylor is now affiliated with CarolinaEast Hematology/Oncology Associates. 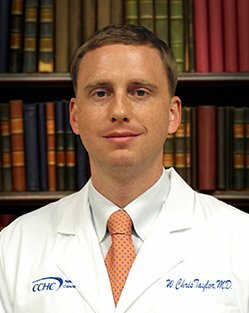 Dr. Taylor has authored several publications during his academic career and is a member of two professional medical societies; the North Carolina Medical Society and the American Society of Clinical Oncology. Dr. Taylor is the Chairman of the Carolina East Medical Center Cancer Committee. He is a member of the Brody Foundation Board of Directors at the Brody School of Medicine in Greenville, NC. Dr. Taylor enjoys spending time with his family. He also enjoys running, hiking and boating. Dr. Taylor is a member of Garber United Methodist Church in New Bern where he serves as the Church Council Chair and a Sunday school teacher. He is also involved with the Boys Scouts of America. He is also involved with the Boy Scouts of America. He is an Eagle Scout and now serves as the leader for Pack and Troop 132 at Garber Church.